The most advanced & affordable table stabilizer. 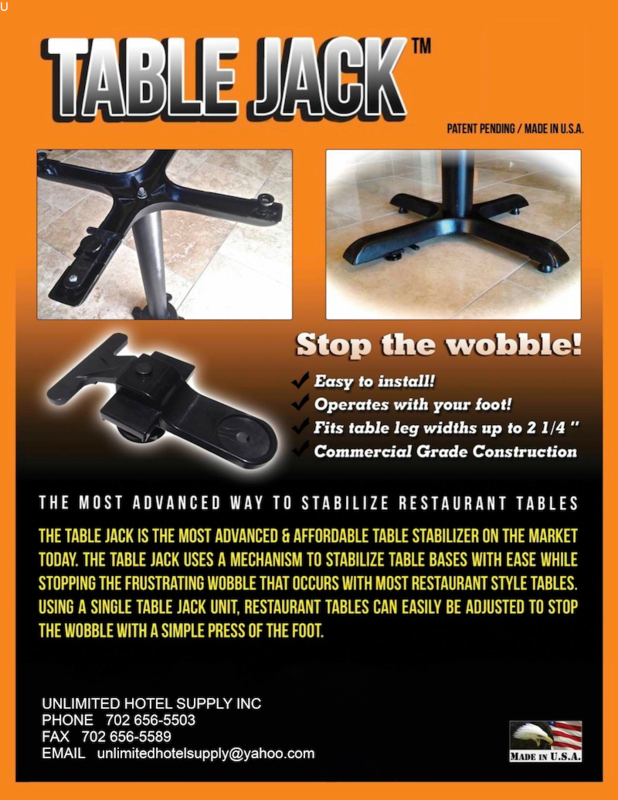 Table Jack uses a mechanism to stabilize table bases with ease while stopping the frustrating wobble that occurs with most restaurant style tables. Using a Single Table Jack unit tables can easily be adjusted to stop the wobble with a simple press of the foot. Easy to Install, comes with the hardware to fit most style table bases up to 2 ¼” width. Commercial Grade Construction, Table Jack is made in the USA. Order Your Table Jack and see for yourself how easy and wobble free a table can be! $12.50/each. No Minimum Order.